Drills: 1. )Reload 4 shells, 1 shell per second (warm up). 2. )Reload 4 shells in 5 seconds with timer. 3. )Reload 4 shells in 4 seconds with timer. 4. )Reload 8 shells as fast as possible. 5. )Reload 8 shells in 8 seconds with timer. 6. )Emergency reload empty chamber from Otto carrier. 7.) Reload 2 shells from belt as fast as possible. 8.) Reload 3 shells from belt as fast as possible. 9.) Repeat drills while moving to right. Then repeat moving to left. Depending on how beat-up my thumbs are after running through a few drills, I will repeat some of the same drills while reloading weak-hand. I still can't completely decide which way I prefer to reload, but at least today I find myself feeling more comfortable reloading strong-hand. But, you should be familiar with both in case you get a curveball during competition. Strong Hand Reload: Support the forearm of the shotgun with your support (weak) hand, canting the gun towards your strong hand side. This allows you to visualize the loading port as you reload it. Grab your shells from your caddy with your strong hand. I find its best to arrange my caddies on my belt either directly in front of my handgun holster (2 o'clock), or in place of my handgun holster if its a no-pistol stage (2 and 3 o'clock). Grab 4 shells and drive them into the loading port using your thumb to push forward and your index finger to guide the tip of the shells into the magazine. Your third and fourth fingers are simply support to keep you from dropping shells and shouldn't do much here. Weak Hand Reload: Keep your strong hand on the grip of the shotgun and use it to support the gun. Either rest the stock on your hip or under your armpit for added support. If you are really strong, you may be able to keep the gun shouldered while reloading,which is faster. 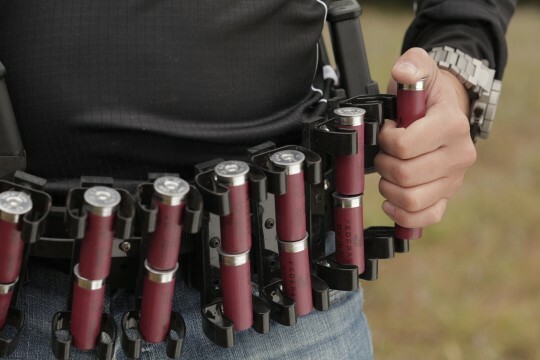 I usually keep my shell caddies on my belt between 10 and 12 oclock for weak hand reloading with the first caddy at 12 o'clock). Using the same steps as the strong hand reload, reload 4 shells from the belt using the thumb and index finger primarily. Dropping Deuces/Load 2/ Twins Method: I believe this to be the fastest reloading method I've seen so far. I am not using it yet because I don't have the equipment and my shotgun is not optimized for it. I still practice it at home occasionally, because I plan on moving toward it in the future. Specialized carriers like the one at the beginning of this post have the shells arranged in pairs with one on top of the other. With either weak or strong hand, the shooter grabs two shells, flips the shotgun upside down and drives the shells into the magazine one behind the other. I've seen some insanely fast reloads using this method.